Above is a quirky little Micronauts accessory. 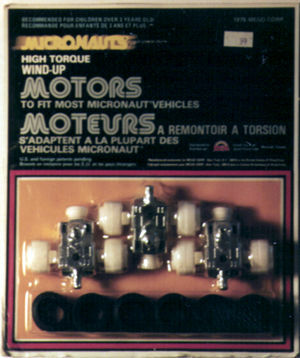 As you can see, this is a set of three wind-up motors marketed as replacements for broken motors that came with many Micronauts vehicles. It appears that these motors were only sold in Canada. These motors on card are considered very rare due to the fact that most were probably opened upon purchase (why else would you have bought them!). Of course, their rarity is tempered by the relative lack of function still on card!